Figure 2. Temperature probability for March through May. EC indicates equal chances for above normal (A), normal (N) and below normal (B) temperatures. Figure 3. 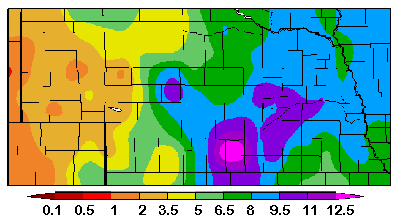 Precipitation probability for March through May. EC indicates equal chances for above normal (A), normal (N) and below normal (B) temperatures. As the 2009 crop production season rapidly approaches, it is time to take a look at how moisture patterns since last fall have impacted soil moisture reserves across the state. In short, there appears to be a large variation in precipitation trends from west to east that could lead to both drought intensification and above normal flood risk. Figure 1 depicts the moisture received across the state since October 1, 2008 which defines our soil moisture recharge period. Most of the western third of Nebraska has received less than five inches of moisture, with the entire state showing less than 3.5 inches. In comparison, much of the eastern half of the state has had 8 to 12 inches of moisture. Looking at precipitation distributions since October 1, the overwhelming majority of this moisture fell in October and December. Lost in these totals is the heavy moisture (3.5-6.0 inches) received across the eastern fourth of the state in September. The remainder of the state received 2.0-3.5 inches of moisture, which was sufficient to meet demands of late maturing crops. Past research indicates that approximately 75% of the moisture received between October 1 and April 30 will be stored in soil profiles, with the remainder lost to evaporation and runoff. Therefore, 2.50 to 3.50 inches of soil moisture recharge should have occurred across the western third of the state, with 7 to 9 inches across eastern Nebraska. Typical eastern Nebraska soils will hold 2 inches of available soil moisture per foot, so precipitation data suggests that the top 4 feet of the soil profile is at or within an inch of field capacity. There remains little room for additional moisture in the soil profile and the flood risk will remain elevated until spring and summer crops begin extracting enough moisture to make room for additional precipitation. The western third of Nebraska currently has an elevated drought risk, due to low soil moisture reserves. Although western Nebraska is not currently depicted as experiencing drought conditions, Drought Monitor authors are closely watching the Southern Plains drought and its steady expansion into the West Central Plains. Normal moisture will be required across western Nebraska during the next two months to keep drought conditions from expanding into the state. National forecasts for the March-May period (Figures 2 and 3) project a broad area of below normal precipitation for the southern U.S., central and southern Rockies, and the south-central Plains. Above normal temperatures are projected for the Southern Plains northwest into the central Rockies. Western Nebraska lies on the northern fringe of the area where above normal temperatures and below normal precipitation are forecast. These forecasts are a reflection of the current La Nina pattern of below normal temperatures along the equatorial Pacific Ocean region. Drier and warmer than normal conditions are typical across the southern third of the U.S. during winter and spring. Since this is the second consecutive year of La Nina, impacts can be more severe for areas that experience similar conditions in the first year of the event. Statistical analysis of past second year La Nina events indicate a bias toward above normal temperatures and below normal moisture across western Nebraska from February through August, with peak intensity occurring during the July-August period. If the event dies prior to June, statistics suggest that these impacts are not as severe, but still occur. Eastern Nebraska typically sees a cool dry March, wet warm April, then dry warm conditions from May through August. Eighteen global models predict La Nina/El Nino development and 16 indicate that this event will end prior to June. Last month these same models indicated a 50/50 chance that the event would continue through the summer. Even if sea surface temperatures return to normal prior to June, residual atmospheric effects will slowly diminish as the summer progresses.